Cutting tool and tooling system specialist Sandvik Coromant has unveiled a new blade for its CoroCut QD parting-off system, which in combination with new process methodology, substantially improves the tool’s stability by realigning the resultant cutting force. Among numerous benefits available to the customer are improved productivity, enhanced surface quality and reduced noise levels. With conventional parting-off tool configurations on turning centres and multi-task machines, the capability of feed motion in the XZ plane is an inherent limitation. When performing parting operations the resultant vector of cutting forces is inevitably directed sharply across the tool’s cross-section, leading to high loads and potential deformation. 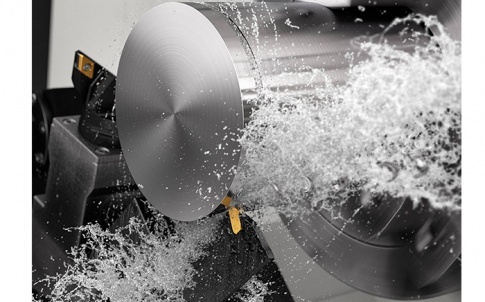 To remedy the situation, Sandvik Coromant engineers have developed a solution that takes advantage of capability in modern turning centres and multi-task machines to feed the tool in the Y direction. In the new concept, the top face of the insert is placed parallel to the end of the blade, as if rotating the insert seat 90° anti-clockwise. The new blade cuts its way into the workpiece with its front end, which roughly aligns the resultant vector of cutting forces with the longitudinal axis of the blade. FEM analysis confirms that this eliminates the critical stresses typical to conventional blades and increases blade stiffness by six times compared with standard designs. With enhanced stiffness, customers can increase feed rates or use a longer overhang without losing stability. When deployed on turning centres, the biggest benefits of Y-axis parting are improved productivity and process security. For multi-task machine users, Y-axis parting blades offer increased accessibility and capability for larger diameters. In fact, a pre-test confirmed a 50% increase in overhang when parting-off a conventional 120 mm diameter bar at the maximum feed capacity of the insert, thus helping to maximise the full potential of the machine. Furthermore, a 300% productivity increase was achieved without any compromise to process security. In a customer test case, Y-axis parting successfully replaced band sawing for a 180 mm diameter Inconel bar, resulting in significant productivity improvement due to dramatically shorter machining times. Another advantage of Y-axis parting is that it requires minimal changes to typical production set-ups. Importantly, the same program can be used for all components, while another major benefit is that practically no extra tool costs are incurred as existing CoroCut QD tooling can be utilised. There is also high potential to make genuine time savings when the workpiece is clamped at both ends as no other operations are possible during parting-off. The new CoroCut QD blades come in widths of 3 and 4 mm. Standard length versions (in both 3 and 4 mm widths) are offered for parting up to 120 mm diameter, as well as an extra-long 4 mm wide blade for parting up to 180 mm diameter. Conventional CoroCut QD blade adaptors and inserts can be used with the new blades.